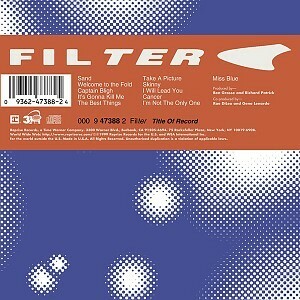 Title of Record is the second album by American industrial rock band Filter. It was released on August 24, 1999 and included the popular single "Take a Picture", a noted departure from the dark sound of the band's 1995 hit "Hey Man, Nice Shot". The album has sold more than 1 million copies. It is their best-selling album to date. In support of Title of Record, the band performed on Family Values Tour 1999.